As a theologian, I learned how moral and ethical language are necessarily relative to the society or speaker, and I quickly stopped using the terms 'good' and 'evil' which, it seemed to me, are usually used with an objective intent. In fact Nietzsche agreed with me when he wrote 'Beyond Good and Evil', so the matter was actually sorted out a hundred years ago, in my view. I get very rattled when people call me good, because it takes no account of all the CO2 I emit, the hearts I break, and the money I feed into dubious institutions with my consumption patterns, not to mention all the religious fundamentalists the world over, who are unfortunately entitled to and equal opinion, and would deem me damned if given a chance to offer it. In fact, I would get rather tetchy when any adjective was ascribed to me at all. If someone said I was brave I would start to recall my most hideous moments of cowardice of which the appraiser was ignorant, and all the noble acts in books and films which I would consider brave, and I would muse on the fine line between bravery and folly, by which time the meaning of the complement would have been completely drained out. I now understand a little better that such complements are not meant as objective statements about the nature of my being, but as friendly ego-massages. But I digress. These two words, good and evil, were banished from my vocabulary along with a few others, in favour of words like helpful or healthy, destructive or contrary, because I thought that people who understood the world did not use such binary language. So when from the comfort of my Nietzschian relativism Bush talked about the axis of evil, it was something of a wakeup call. True, Reagan had also talked about the 'Evil Empire', but I was only 11, and he was speaking to his supporters the evangelicals. 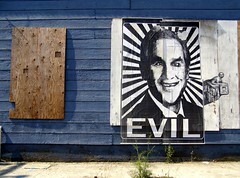 We see now that Bush meant 'evil' very literally, very theologically. He was appealing to his core voters the simple Christians, and to the naive nationalists who believe that America is somehow the 'best' country in the world; people who haven't even heard of Nietzsche. He was declaring his intention to start three wars, probably building on the new doctrine of pre-emption. As I get older, more suspicious, and more competant, I find myself using the word evil, at least internally, more often. There's no other word with such theological certainty, so galvanising, so absolute. I used to be able to waver on any issue, say it was just a matter of values, the winners always write the history and Good always overcomes Evil. But these days I think, hell, everybody knows what evil means, why can't I express myself strongly? Well, after I've defined the term, I shall than feel free to use it. And this will be no namby pamby relativist defintion either! Evil is a state of mind of a person or clique in a position of power, which sacrifices the welfare of powerless people for any reason other than the welfare of other powerless people. This is a very socio-political definition, but I think it's one we might all agree on without getting into metaphysical disputes. Firstly it is depersonlised, which allows room for our incomplete knowledge and the possibiltiy of redemption. More than that, it can be explained in terms of group-think, as if evil emerges out of an extreme sub-culture as a natural element in human nature. It is pragmatic, so the evil is proportional to the deed. This allows for the human trait of measuring the magnitude of things according to their proximity. So we can say that the evil of a Hannibal Lecter, is trivial compared to, say, starting a war. Furthermore, this definition deals with the idea of a necessary evil, by allowing that some decisions are a genuine trade-off between people's welfare.